Over the course of the 90s and 00s, the melodic rock and metal market has been swamped with metal tribute albums, often featuring a host of well known performers. Such releases are often workmanlike affairs with the featured artists never really making the most of their talents. Occasionally, you’ll find a surprisingly good one, as was the case with ‘Dragon Attack’, a metal tribute to Queen (something which really ought to have been awful, yet somehow retained a sense of fun and a great deal of charm). 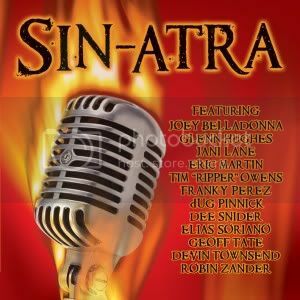 ‘Sin-atra’ – a metal tribute to Frank Sinatra, masterminded by ex-Kiss/Skull man Bob Kulick and Mr Big’s Billy Sheehan – didn’t sound like a very good idea on paper, and in reality, it still isn’t. Most of the performances take things into the realms of the ridiculous and while there are a lot of gifted vocalists featured, half of them have not survived the project with any dignity. The tribute begins with perhaps Sinatra’s best known song, the ubiquitous ‘New York, New York’, left in the hands of the superbly talented and unique Devin Townsend. Over a juggernaut riff, Townsend adopts a really over the top metal voice – the kind you’ll find on the heavier parts of his ‘Infinity’ and ‘Ziltoid’ albums. In a powerful croon, he declares he’ll be “king of the hill, top of the heap, infinite overlord of all space and time…”. As expected, Townsend takes more of a lead than some of the other performers, with parts of his performance featuring his signature sound, multi-tracked guitars and keyboard drone. Equally cool, Mr Big’s Eric Martin gives ‘Lady Is a Tramp’ a decent send off with an arrangement which wouldn’t sound too out of place on his ‘Destroy All Monsters’ album from 2003. Martin’s voice has always been one of the best in melodic rock, and here is no exception. Following a decent staccato opening riff, things settle into a great melodic rock groove where chunky guitars meld well with a horn section, over which Martin delivers a vocal which fuses his rock and soul styles to great effect. He was right to approach this with a similar style he may have given one of his own numbers – in all, a very naturalistic and classy performance. During ‘World on a String’, Doug (aka dUg) Pinnick croons in a deep tone, one almost unrecognisable as being the same man who sang on the King’s X classics ‘Gretchen Goes To Nebraska’ and ‘Faith Hope Love’. With a voice far lower than his 80s and 90s vocal style, he treats most of the number softly and respectfully, until midway, until Kulick and co just can’t hold it in any longer. The metal riffs don’t improve the track particularly, but they work better than the parpy horn section. Ex-Warrant man Jani Lane (a stalwart of tribute albums) makes a reasonable effort with ‘That’s Life’ – augmented by Winger/Whitesnake man Reb Beach on guitar and a predictable female backing harmony. Truthfully though, David Lee Roth’s similar version of the song (featured on his 1986 album ‘Eat ’Em and Smile’) will always be its definite rock cover. Queensryche’s Geoff Tate lends his instantly recognisable style to ‘Summerwind’, and miraculously, the house band (featuring Kulick, Sheehan, Velvet Chain’s Brett Chassen and orchestral arranger Doug Katsaros) lend the track an almost sympathetic arrangement. A couple of Kulick’s riffs hit the mark and Katsaros’s orchestration is the album’s best. Tate attacks the number like a total professional, but even so, it’s only really worth checking out if you’re a die-hard fan. Twisted Sister’s Dee Snider’s vocals on ‘It Was a Very Good Year’ are fantastic and Katsaros’s strings are suitably arranged, but the chugging riff which brings the two together isn’t that interesting. At times sounding like a poor approximation of Led Zeppelin’s ‘Kashmir’ played by ham-fisted rockers. It also would have benefitted from being slightly shorter – by the time it starts to fade out at the five minute mark, it’s already started to sound a little dull. The rest of ‘Sin-atra’ is simply awful. The remaining numbers are very poorly realised, even nearing desperation at times. Over a chuggy riff augmented by John Barry-esque horns, Anthrax’s Joey Belladonna struggles to croon his way through ‘Strangers In The Night’, absolutely murdering it in the process. The chosen vocal style really doesn’t suit him and it results in embarrassment for all concerned. Similarly, Glenn Hughes wails and squeals his way through ‘I’ve Got You Under My Skin’ in a painful manner, not helped by an average musical arrangement. ‘Fly Me To The Moon’ suffers the same fate once it’s been strangulated by Robin Zander – hard to believe that such an ugly performance could be the work of the same voice from Cheap Trick’s ‘In Color’, one of the greatest power pop releases ever. If he’d sounded like this back in the mid 70s, he would never have got a foot through the door of the Budokan, let alone contributed to a world famous live album. His vocal style just isn’t meant for the heavy metal style the song has been given though, so it’s a little unfair to lay the blame squarely upon him. Yes, a lot of this release really is that bad. Possibly as misjudged as ‘Metal Zeppelin’ – a heavy metal “tribute” to Led Zeppelin from 2002, featuring lots of second division European metal bands…and Blaze Bayley. It was a mistake to try and make Sinatra’s tunes fit the metal mould while retaining a swing/crooning style to most of the vocal performances – it just doesn’t work. You have to wonder what everyone was thinking when they signed up for this project… At least Devin Townsend had the smarts to realise this was rather silly and played it up for all of its absurdness. None of the tracks here represent worthy additions to the performers respective back-catalogues. Even the completists among you will possibly baulk at most of these performances. You could approach ‘Sin-atra’ as a bit of fun, but most of it is so heavy handed it makes difficult listening. Eric Martin’s contribution is worth downloading (and even Townsend’s piece of over-the-top theatrical silliness too if you’re that way inclined), but otherwise, this is an album you could definitely live without. This entry was posted in Album & EP Reviews by Real Gone. Bookmark the permalink.